I can't wait to make my debut in Amsterdam, Netherlands. I'll be traveling with my good friend, and killer drummer, Kevin Van Den Elzen. Bimhuis is lauded as one of the finest venues in the world. I'm honored to be there. Back at TRiP at the end of the month. We’re going to change it up a little for this one. I’m putting together a 5-piece which will be the same instrumentation as the group with which I’ll be playing in the Netherlands; vibes, bass clarinet, guitar, bass and drums. Downtown LA, is the place to be if you’re looking for great live jazz. Every Thursday night we inhabit The Brack Shop Tavern from 10p-1a and throw down. The opening trio sets continue to be some of my favorite musical experiences to date, and after we’re done we open it up for others to sit in. There are a LOT of great musicians coming through. NO COVER!! Sound Roads is a great community music school. This will be my second performance and clinic there. It's a lovely, intimate space. This time, I'll be with my trio Thr3 which will include Ben Shepard on bass; drums TBA. The clinic will take place from 5p-6:30p, then a wine reception and concert. Back at our favorite monthly spot to play, TR!P in Santa Monica. Every Tuesday night is hailed as their "Jazz Night" and I've been there every 4th Tuesday since October of last year. I've got a bunch of new compositions to throw at the guys, and I'm happy to say that 8 of the 9 of us will be there, and we'll be joined, once again, by my dear friend and great singer, Diana Kazakova. Ojai is such a gorgeous place, even gorgeous to drive in and out of. Can't wait to get back together with bassist Bruce Lett and percussionist Brad Dutz; the music we make is always spontaneous, electric, and engaging. Sure we play killer instrumental jazz ... but did you also know that we collaborate with some of the greatest singers in LA? Come check us out at this fun, outdoor jazz series in Santa Monica as we take the stage with Laura Mace, an power house vocalist with a tender side as well. Back at the newly renovated Vitellos in Studio City with a monster band. Josh Nelson is simply one of my favorite pianists and he and I have an undeniable kismet that was present upon the first moment playing with him. On bass, we have none other than Alex Boneham who is quickly becoming everyone's first call bass player, and on drums is Shawn Baltazor, boasting an impressive resume as well, he was mine and Josh's go to when we were looking for a drummer with impressionistic sensibilities and deep roots in jazz. We'll play some duo and mostly quartet. I'm bringing back the 8-piece to everyone's favorite place in LA to play, the blue whale. It's been a fruitful time for me in terms of composing. I've been writing a lot of new material and workshopping it at a cool local haunt in Santa Monica so we're well-lied and ready to throw down. Back at TR!P with my Collective as part of my residency on the 4th Tuesday of every month, this time as a warm-up to my album release at Blue Whale on July 7th. I'll have the whole crew with me - John Tegmeyer and Danny Janklow up front on clarinet and alto sax, respectively, flanked by Adam Ratner on guitar and Mike Ragonese on keys, in the back is the percussive ramblings of the magpies, Pete Korpela and Scott Breadman, and holding it all down for us is Cooper Appelt on bass and James Yoshizawa on drums. Killer band, great venue, awesome original music, and all under the leadership of the young, focused and passionate Danny Janklow. Not to be missed. Continuing with my 4th Tuesday of the month residency at TR!P... I've got some new tunes and we're going with a 9-piece band. This gig will serve as a prep for a studio date and our show at LACMA on June 1st. There's no cover. You got no excuse. I'm very excited to see what this band can do. In their own right each of these guys are monster players and in addition, they each are some of the most sensitive and sensible musicians with whom I've had the distinct pleasure of performing. Sam First is a top rate venue for jazz. Owned by a true appreciator of the art form, every detail is hand picked and specifically curated for the pleasure of enjoying live jazz in an intimate setting. I'm honored to be on the roster. We're here every Thursday. High end, high energy live jazz. With some of LA's best and brightest, creative musicians coming through to sit in. No cover, great hang... What more could you want? 45th BIRTHDAY BASH and JAM SESSION!!! New extended hours at Brack Shop means more time to hang after the hit. Mancini is back at the West Side's favorite neighborhood music venue and watering hole, TR!P on Lincoln Blvd in Santa Monica, just south of the 10. It's a monthly residency (every last Tuesday) Come in, order a drink. There's no cover, so when Mancini barks at you from the stage to pony up (ie. hit the tip jar), you best do it, cause he's been known to not play until you do. And you need to stick around to Diablo Banco, lead by drummer/singer/madman Andy Sanesi - the smartest, most ignorant live party band EVER!!! 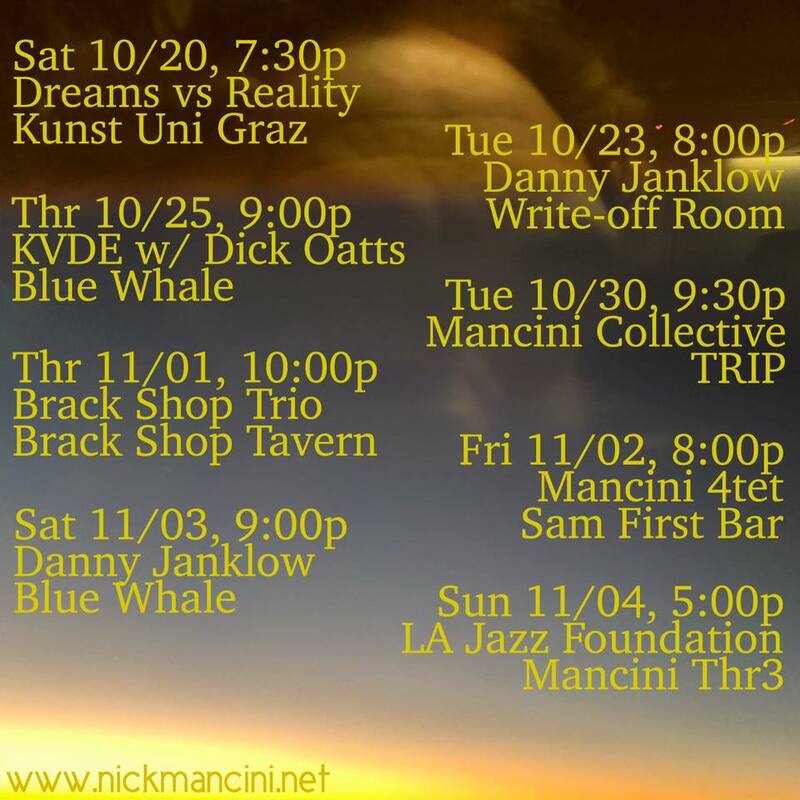 Mancini is back at The Miles Memorial Playhouse, which is becoming quite the haunt for super high quality jazz concerts on LA's extreme west side. Hilarious and devastatingly charming, Latin-Jazz star, Louie Cruz Beltran hits the stage with is Latin Jazz Orchestra, featuring Mancini on vibes at the Chino Hills Jazz and Blues Festival. New extended hours at Brack Shop means more time to hang after the hit. You're definitely going to want to come on April 26th; it's my 45th Birthday Bash/Jam. Bring your axe! Sublime artistry, boundless creativity, and consummate technique are the hallmarks of this of locally celebrated, world-class duo. Although they hail from starkly contrasting home fronts, pianist Josh Nelson (a cool Southern California native) and vibist Nick Mancini (a hothead from chilly upstate New York) possess a profoundly unique musical kinship. Both player-composers appreciate the value of a well-conceived composition and the turn of a clever melodic phrase, but it’s their organic synchrony and dulcet tone that distinguish this compelling musical coupling. Join Josh and Nick as they present an evening of mostly original music with a few choice standards in both duo and quartet settings, with Jordan Richards on bass and Shawn Baltazor on drums. Bassist Ahmet Turkmenoglu, drummer Steve Hass, and vibraphonist Nick Mancini are weekly at this DTLA bistro/bar located at 525 W 7th St, between Olive and Grand. Great drinks, good company, world-class jazz and an impressive array of LA's finest jazz musicians routinely sitting in. Trombonist and Composer, Kevin Hicks releases his debut CD at San Pedro's BEST room for live, intimate music. Featured is Nick Mancini on vibes, Cooper Appelt on bass, and Jake Reed on drums. Call for student discount prices.